Welcome to my website. It is my sincere prayer that this site will help and bless you. If you dig around you will find a wealth of information that will be helpful to your Christian walk. You will find articles, MP3 audio messages and videos on many Christian topics here. Please keep checking back as we add more information to this site. Please e-mail me to be added to the mailing list if you wish to receive the fresh articles as they are written every couple of weeks. Also please let me know about any links that don’t work or any other resources you would like to see on the website. To e-mail me click here. We are constantly adding new audio messages. Occasionally these may be individual messages, but generally I have found it more efficient to upload all the studies on an entire book in a single downloadable Zip file. The latest series was completed in April 2018 and is available here. Hendrik Van der Plancken has resumed translating articles into Dutch. You can see the latest ones here. “My people are destroyed for lack of knowledge” (Hosea 4:6). This has never been more true than today. The church in the West has welcomed a flood of heresy and false gospels because neither Christians nor their leaders understand the fund amentals of the faith. Almost every problem believers face is due to a lack of understanding, and of applying, these fundamental principles in their lives. The author seeks to reestablish the foundational principles of the Faith that have long been lost to the modern church. According to Hebrews 5:12, every Christian must know, and understand these principles, but more, should be able to teach them to new believers. The book has been designed to be easily understood by the average Christian, but also to be used as a study guide in churches, home groups, new member classes, and adult Bible classes. 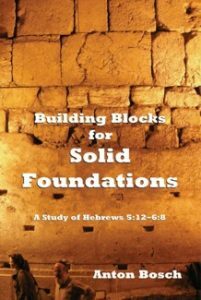 To this end, each chapter concludes with a study guide which will help the reader as well as those who lead Bible studies to thoroughly comprehend the lessons. At the end of the book is an appendix containing some helpful hints how to lead study groups more effectively. Available on Amazon as a paperback and Kindle book.